It is not necessary for a child to own a horse or pony, but they must have access to one when required. Programs are offered in dressage, eventing, show jumping, mounted games, tetrathlon, quiz, vaulting, foxhunting, and polocrosse. During unmounted meetings members learn about feeding, shoeing, veterinary care, and other areas of horse management. Under adult supervision, the more experienced Pony Club members instruct and assist younger members. Pony Club provides opportunities for instruction and competition in English riding, horse sports, and horse management for children and young adults up to 21 years of age. The term pony reflects the age of the members, rather than the size of the mount. Horses and ponies of many different breeds, shapes, and sizes are seen in Pony Club activities. However, certain mounts, such as stallions and those under the age of five, are considered unsuitable and may not be used at Pony Club competitions. 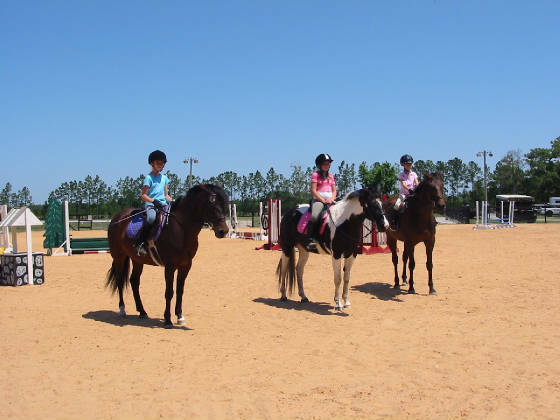 St.Johns River Pony Club is in the Sunshine Region. Our club includes Duval and St.Johns Counties. If you have any pictures or information you would like put on the website, e-mail or call Kathleen.